Are articles on Albania in international media being sponsored? The last issue of the weekly “The Economist” has sparked debates in Albania,after the publication of a part of the article which promoted the government reforms, by considering the country as a leader in the Balkans. The Economist’s article “Albania leading reform in the Balkan region”, was published in its last issue of 16-22 January 2016. But this article sparked many debates between the Albanian government and the opposition. The latter, through a declaration of the secretary for Public Relations at the Democratic Party, Grida Duma, accused PM Edi Rama of “spending hundreds of millions of Albanian taxpayers’ money in order to purchase 8 pages of advert on the most expensive magazine in the world, The Economist, for an advert-article which praises it, but which, on top it says that it’s a paid article”. The Prime Minister’s office reacted against the DP’s accusations. According to the Prime Minister’s office, it can only happen in Albania for an opposition party to accuse the government of promoting the country and encouraging foreign investments. 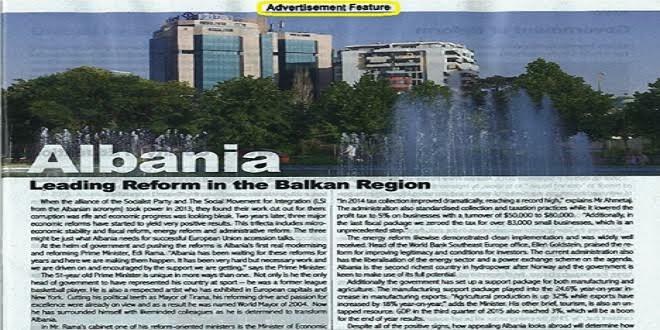 But, has the Albanian government paid for the article of this economic magazine? IBNA brings you this document which reveals details on the how a fund of 36 million ALL (300 thousand euros) was offered. The opposition denounces that “Edi Rama has spent hundreds of millions of Albanian taxpayers’ money to purchase 8 pages of advert in the most expensive magazine in the world, The Economist, for an advert-article which praises it, but which, in the top it says that it’s a paid article”. One page of the British magazine reads: “Albania: Leading Reform in the Balkan Region”. Another reads “One Very Elegant Lady’s Invisible Work”, an article which refers to the minister of Urban Development. In another page, there’s a title “Albania Brings European Standards and Quality in Education” and another one “Tourism Gets the Attention it Deserves”. On top of the article and on top of every page of the article, there’s the following phrase: “advertisement feature”. Secretary for Public Relations, Grida Duma explains why the article is pure advertisement. She says that “according to British advert rules, every page that praises Edi Rama, has ‘Advertisement Feature’ written on it, which means, a paid article”. Furthermore, Mrs. Duma adds: “Do you know what an advertisement feature is? This is the official description of the British legislation: “An advertorial is an advertisement feature, announcement or promotion, the content of which is controlled by the marketer, not the publisher, that is disseminated in exchange for a payment or other reciprocal arrangement”, Mrs. Duma quotes. This means that in this case, the journalist who has written the article that praises the Albanian government as the leading reformer in the world, it’s the Albanian government itself. As it’s clarified in the rules of publication of these articles, The Economist doesn’t hold any responsibility for what is written there. Duma says that “the 8 page self praising of Edi Rama, is without any doubt the most expensive one in the history of these years and it has cost a lot to Albanian taxpayers.” According to her, “this disgraceful use of Albanian money, not only doesn’t help Albania and the serious situation of its citizens, but it also doesn’t shed light on the tarnished image of a prime minister who has 200 million euros in wealth gained through bribery for construction permits, who shared 600 million euros with CEZ, who is behind 1 million USD a day in tax evasion in customs, who has forced 100 thousand fellow countrymen to leave the country and who filled parliament with criminals and traffickers…”. In its conclusion, the opposition says that “Edi Rama is the most corrupt prime minister in the Balkan and there is no paid article or expensive advertisement which can save him from the judgment of the citizens”. The government says that Albania is the only country where an opposition party accused the government of promoting the country and of encouraging foreign investments. The government says that The Economist is one of the most prestigious magazines in the world, which is read by important investors and decision makers. “In a special issue of this magazine which will be distributed in the Davos Summit, Albania’s promotion is an excellent opportunity to attract important foreign investments in Albania, which create new jobs, encourage tourism and domestic production”, the government explains”, the government explains. Admitting that the article is paid, the government says that it sees “The Economist’s reportage as an excellent opportunity to promote the country the same as other countries such as Macedonia, Croatia, Turkey or Serbia have done”. The government admits that it has signed a contract of 36 million ALL to publish an extensive reportage on Albania. But is the DP right when it claims that the article is a mere praising and that the magazine doesn’t accept any responsibility for promotional articles? The government explains: “The Economist, as one of the most prestigious magazines with a high number of readers worldwide, cannot publish any information which is not genuine or not verified and which is not written by journalists certified by it”. The government says that the DP “continues to behave like the old government, with the language of hate, slander and primitive defamation”. According to the government, these point out “the lack of leadership, of the program and ideas for Albania”. “Time requires the Democratic Party to take off the mask of the old government and become a new opposition which is lacking Albania for two and a half years”, the Albanian government suggests. On the other hand, it stresses that “in contrast to the other government, we don’t spend millions of dollars of public money to broadcast government adverts or to pay lobbyists who were only required by the government to spread the slanders of the former prime minister of the country against the opposition of that time”.